Founded in 2006, Beach Money has been widely utilized in many towns in Japan as an environmentally friendly local currency that cleans up our beaches. Currently, we have 128 Beach Money shops in Miyagi, Tokyo, Kanagawa, Chiba, Shizuoka, Yamanashi, Osaka, Wakayama, Kochi, Hyogo*, Nagasaki, Fukuoka, kagoshima and Oahu, HI. *Hyogo has created their own system and it's called "Love Money.” We are always looking for new shops & businesses worldwide who would like to participate in Beach Money. Please feel free to contact us. Beach Money Guide 2015 copies(only Japanese) can be found at Beach Money Shops. Join the beach cleanups and get one free. 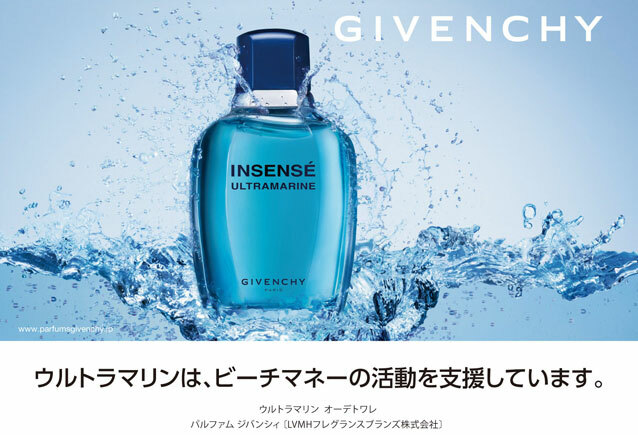 Second Edition of MyLittlePocket is also sponsored by GIVENCHY ULTRAMARINE which has been widely known for it's fresh & aquatic scent since 1995. My little Pocket is the portable, reusable and take-everywhere bag to support you picking up trash even before it gets to the water. Click here for the details of MyLittlePocket. Enoshima Aquarium's Monthly Beach Cleanup! Enoshima Aquarium has been organizing beach cleanups on the 3rd Sunday of every month 11:00a.m. to 12:00p.m. (9:00a.m. to 10:00a.m. in July - September) and we are there most dates. Invite your friends and family to the beach cleanup events to keep our beaches clean and find beautiful beach glass. A chapter about Beach Money is in the NHK radio English textbook. Announcement of the event in Chiba, Tateyama! This is an announcement of a beach event that “ASA Tateyama” in the city of Tateyama in Chiba will participate. We were posted on the morning paper in Tokushima! Under the title “Naruto’s gift shop, The first participant in Tokushima.” A beach money shop called ISLAND was posted. Also the system of the beach money was introduced in the economic section. Beach money became the theme of free research during the summer vacation! News related to the beach money Had a call from the mother of 5th grade in Izu Peninsula contacted us to ask about the beach money as her son is doing research for his assignment during the summer vacation. Checking out Beach money shops in Shonan! Mr. Matsuda of ASA Tateyama came to visit Minami Izu. Mr. Matsuda, who is a newspaper distributor called ASA Tateyama (to the right in the picture) in Chiba came to Minami Izu where the beach money office is located. Bohnichi times of Minami Boso introduced us, beach money! News about beach money dated September 4th, 2018. With cooperation of ASA Tateyama(a newspaper distributor), beach money activities were introduced on Bohnichi Times. We were posted on an August issue of magazine BE-PAL. The beach money activities were introduced 4pgs in the section of “going rural!” on the August issue of BE-PAL. News program in Taiwan picked us up! A Taiwanese TV crew came to visit us in Minami Izu, where the beach money office is located. Posted on weekly kids Jyomo Shimbun in Gunma, on May 20th. I would be very pleased if this will be a trigger to expand Beach money in Gunma as well.